Russell Athletic | SOLIDARITY WITH THE PEOPLE(S) OF HONDURAS! On November 14 an unprecedented agreement was struck between Russell Athletic and the union representing unjustly laid off workers at its former Jerzees de Honduras (JDH) factory. Russell has agreed to open a new facility in the Choloma area, re-hire and provide substantial economic assistance to the 1,200 former JDH workers, institute a joint union-management training program on freedom of association and commit to a position of neutrality with respect to unionization, which will open the door for union representation at all of Fruit of the Loom’s Honduran facilities (Russell Athletic is owned by Fruit of the Loom). Russell Athletic was under serious pressure to repair the damage caused by its decision to close the JDH factory last January, which was widely condemned as an attempt to destroy a newly formed union (see last issue of the Update for details). At the urging of students, unions and labour rights organizations, including United Students Against Sweatshops and MSN, over 100 universities in Canada and the US that have adopted ethical purchasing policies either withdrew their licensing agreements with the company or threatened to do so unless it took action to remediate the violations. Retailers and other Russell consumers were also approached. “This is the first time we know of where a factory that was shut down to eliminate a union was later re-opened after a worker-activist campaign. 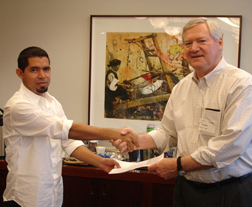 This is also the first company-wide neutrality agreement in the history of the Central America apparel export industry – and it has been entered into by the largest private employer in Honduras, the largest exporter of t-shirts to the US market in the world. This is a breakthrough of enormous significance for the right to organize – and worker rights in general – in one of the harshest labor rights environments in the world,” said Rod Palmquist, USAS International Campaign Coordinator. Talks between the union and the company finally began after Russell Athletic’s membership in the Fair Labor Association (FLA) was put on “Special Review” status last June. An FLA investigation carried out in response to a complaint filed by the CGT, the Clean Clothes Campaign and MSN confirmed the WRC’s finding that the presence of the union was a significant factor in the FLA member company’s decision to close the JDH factory. The FLA told the company it had to negotiate remediation with the factory union (SITRAJERZEESH) and the CGT, and engage with MSN and the WRC. Fruit of the Loom is the largest private sector employer in Honduras, owning eight factories that employ over 10,000 workers, making the impact of this agreement extremely significant. “The partnership being created between a large private employer and an independent union federation is unprecedented in the history of the apparel sector in Honduras and in Central America,” said Nova. Implementation of the agreement will be monitored by a joint union-management committee, with an agreement to enter into binding arbitration in the case of disputes over implementation or interpretation. • Read more on the Jerzees de Honduras Campaign.